Google’s Nest Acquisition: How Will Your Privacy Be Affected by the Internet of Things? In the era of tech giants, privacy has almost become a luxury. This is because people are virtually connected to their computers or the Internet at all times. This has made social theorists quite concerned about the phenomenon known as the Internet of Things (IoT). The Internet of Things is a term coined by Kevin Ashton during a 1999 supply-chain management presentation at Proctor & Gamble. For Ashton, IoT meant that the benefit of computers and the Internet can only come from the documentation of actions. Everything a person writes, clicks, downloads, consumes, uses, searches, and views on the Internet becomes not only a data profile on that person’s behavior, but data that constitutes the space of the Internet. The goal then is to document this data more and more fully, in the hope to be able to obtain a complete picture and scope for businesses to increase their efficiency and effectiveness toward consumers. What Does IoT Mean For People? IoT has become more prominent as more “things” that gather data have been technologically produced. Cell phones, smartphones, and tablets help to gather more behavioral data points about a consumer. Everyday objects that are integrated with new technology, like the television or the car, have also begun documenting consumer behavior. 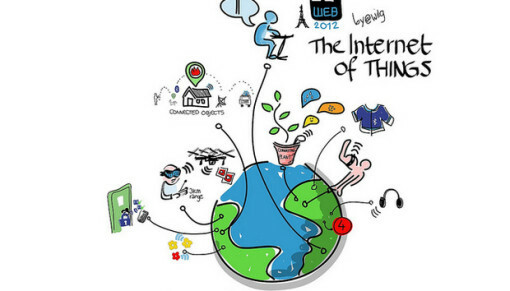 The result is that the IoT is continually encompassing more “things,” and the things are amassing more information. And the more data that is out there, the more valuable this data becomes. Take the example of Nest Labs. Nest Labs is a technology company that specializes in interconnected home products. Similar companies, like Vivint, have helped with home automation, or the further computerization of home products that can ultimately gather data. Nest Labs’ most popular item is the Learning Thermostat—a thermostat that is programmed to analyze a home owner’s preferences and regulate heating and cooling automatically. The Learning Thermostat is a popular example of a IoT “thing”; a machine that accumulates data of a homeowners climate preferences and uses this data to create a comfortable home space. However, this data is now part of the information superhighway where it can be gathered by third parties. It is this scope and Nest Labs’ commercial popularity that caught the eye of Google. In early 2014, Google filed with the Federal Trade Commission (FTC) a $3.2 billion purchase of Nest Labs. Nest Labs is now officially a Google company. It is no coincidence that Google would purchase a company that is part of the IoT trend. Google is more than just a search engine; it is the largest information technology corporation in the world with immense R&D in cloud computing, information technology infrastructure, software, and internet marketing. Google’s success has come from the use of data. People are able to create and share data through Google, and Google captures this data for the intention of creating a better internet experience for people. One aspect in this is Google selling this data to third parties so that those parties can better advertise through the internet to potential clientele. Google has even, at times, given this data to governments, and works closely with government agencies on everything from technological investments to homeland security. As Google has become richer, it has invented new methods to gather data or acquired companies that have ways to gather data (like the acquisition of Nest Labs). This has led Google to become a private for-profit organization with immense data accumulation power. For years, privacy advocates have been concerned with how Google gathers and then utilizes personal data. The Nest Labs purchase in early 2014 is just the latest move by a company that has immense influence over the amount of data on the internet. Up to this point, Google’s Nest reviews, Vivint reviews, and other home automation reviews have been mostly positive. People haven’t felt an invasion of privacy. But a recent article in Forbes highlights that many organizations, like the Electronic Frontier Foundation, are concerned that personal data arising about homeowners in their own homes could be used as consumable data for Google and the third parties they sell to. For many privacy advocates, there is a very scary combination with these two firms: Nest Labs can know if a person has left their home and Google can access data that shows the person left to meet with friends at a social occasion. For privacy advocates, this combination of Google and Nest Labs exemplifies the privacy issues with IoT. With more IoT “things” in the marketplace, often at a monopoly level, people have become not only consumers, but endless springs of data to feed third parties. The internet’s lack of regulation is a good thing when it comes to the free access of information. However, it also provides chances for organizations to get mostly free access on people through numerous forms of technology.